Our extended school year option is flexible to families and their summer vacation plans. Families may extend their children’s school year for as little as one week and as long as ten weeks. Another option is for students to start the school year a few weeks earlier than the traditional fall start. 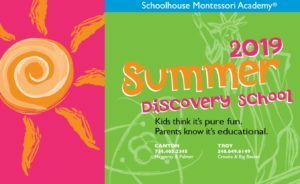 During the summer school weeks, Schoolhouse strives to provide a range of academic and fun activities, integrating different themes into each week. Imagine the excitement as children probe the Coral Reef, visit the British colonies before they became the United States, build a miniature rain forest and discover how the rocky, sandy desert hides a world teeming with life. That’s what they’ll find in Schoolhouse Montessori Academy Summer School.